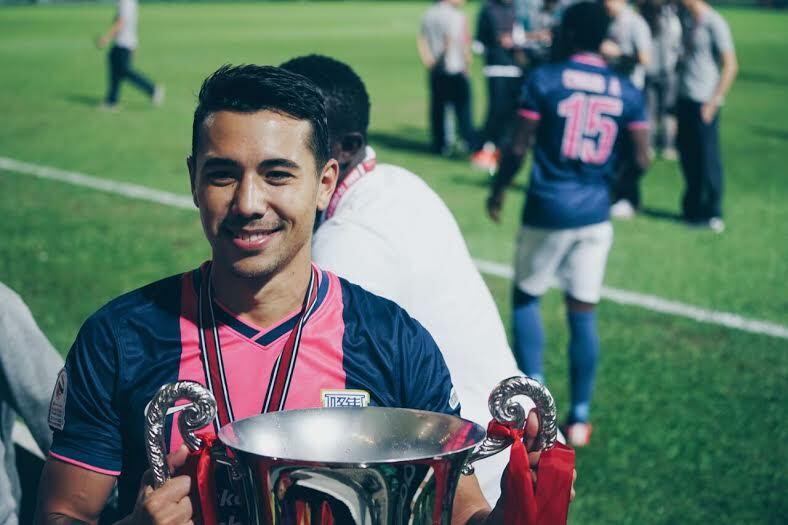 Matt Lam is a former Canadian U20 player currently making waves with Hong Kong powerhouse Kitchee. A product of legendary Ajax Academy, the Edmonton native has played in the NASL (with FC Edmonton), Japan’s second division and Croatia’s first division prior to arriving in Hong Kong, where he’s hoisted 6 trophies including 2 league titles in 3 seasons. At only 25, he’s seen more success and darkness than most players do in their careers. We spoke to him about playing in Asia, corruption in soccer and the questions of which team to represent. SSPC: Most Canadian soccer fans (myself included) don’t really know that much about the game over in Asia (eg. crowds, quality of play, fields, ect.). What’s it like playing there compared to North America and Europe? Matt Lam: Playing over in Hong Kong has been a unique experience. With all the teams in the league coming out of one city clubs fight for everything, supporters, stadium rights, sponsors. It has positives and negatives with everything. There are a number of quality stadiums mixed with a few mediocre ones, since everyone of course wants the best stadiums to be their home grounds it is decided on the previous years placement who gets first pick on a few of the better stadiums. It is very different from playing here than Europe and North America. I also played in NASL when it was still at its very early stage so it would be tough for me to compare it now. The Hong Kong league has been around for an extremely long time so it has that bit of history behind it similar to Europe but, I don’t think you can compare most places to the European atmospheres for football. SSPC: What motivated you to play in Hong Kong rather than try and find a place to play elsewhere in the NASL, Asia or Europe when you departed Edmonton? ML: After my time with FC Edmonton I had an offer from the rival club of Kitchee actually. I think they knew of me a bit from playing in Japan. I was interested and also because of my personal connection to the city. My dad is from Hong Kong and I saw an opportunity to possibly get my Asian passport. Unfortunately due to some complex immigration laws I was unable to get that but I found my way to Kitchee and was very happy that I made that decision. The club in the last 8-10 years has developed itself as one of the power houses in Hong Kong and in the AFC cup of Asia. A club that tries it’s best to mimic the ways of Barcelona. A number of coaches have come and gone now in the last few years and all were Spanish including the current manager. The club has just recently moved into its fantastic new training facilities and has a lot of big goals and aspirations. I have had a lot of personal and team success here in the last couple years and I hope that continues. SSPC: What do you think of Hong Kong Premier League’s short season? Does it leave you wanting more? ML: When you see the number of teams in the league you would imagine the season is very short. We actually match many of the European leagues for schedules. The League isn’t very long but there are a number of cups to fight for which really fills up the schedule. Preseason included we run from Mid July to end of May. This season apart from the League we have 5 cups to fight for not including the AFC cup. We definitely get the games in by the end of the season. SSPC: You mentioned your father being from Hong Kong, do you see yourself playing for Canada or Hong Kong in the future? ML: Had I been able to get my Hong Kong passport things may be different. Here in Hong Kong they were doing as much as they could to help me get my passport so that I could play for the Hong Kong team. It was nice to see how much they would have liked for me to put on that kit along with all the fans. It will be sometime now for that to be possible for me. I have said though, that if Canada came calling I wouldn’t say no. I would love to have the opportunity to represent my country. To me Canada is home and I would love to be a part of the national team setup again. SSPC: Your first professional experience was with Croatia Sesvete in 2009-10 when the team found itself at the centre of a match-fixing scandal. How did that event impact you? Did it change the way you look at the game? Did it make you more cautious? ML: Yes, that was quite the experience that I had. At a young age I had an opportunity to be playing in the top league in Croatia, the opportunity to play against some big clubs that compete at the highest levels in Europe. I was very excited to see where that could lead. Unfortunately, things went wrong very quickly. I had been there for a few months and was starting to earn my place in the core squad. A few days after my first substitute appearance was when the president decided that no one was getting paid anymore. It was a terrible period, one that finally led me to break off my contract with them and return home, after my landlord came to my door telling me that the club had also stopped paying the rent for my apartment of course. To be honest though, maybe I was just a naive Canadian player but I never really noticed anything suspicious about match fixing at the time. Thinking back on it now I remember some strange things happening that obviously had to do with that stuff. I’m thankful that I got out of there in a hurry though before I myself may have been impacted more by the huge match fixing scandal that took place. If I’m not mistaken there were a handful of players that went to jail for their involvement. I could talk for days about my time in Croatia for sure. It was a bad experience but I learned a lot from it and definitely have been much more cautious about everything to do with my career since. SSPC: Do you keep up with any of the developments in Canada at both the club and national team levels? ML: I try to follow up as much as I can from the Canadian team and the North American leagues. With the time change its pretty tough to watch any of the games live but I’m always checking the results. SSPC: Prior to Ajax and Sheffield United’s academies, what kind of training did you have growing up in Edmonton? ML: The real foundations of my game came from my dad. He was the one who made sure developing good technique and understanding of the game were most important. My brother and I and my sister also (I forgot to mention her one time and never heard the end of it) would go out to the neighbourhood field for hours working on different skills, challenging each other and my dad was always there to help and push us. Later I played the bulk of my youth soccer with the Edmonton Juventus Club where I had a couple great coaches who all had a hand in developing me as a player. We had a a great group of players, a few of the guys from the team are some of my closest friends. SSPC: Figure I might as well ask, what happened between you and FC Edmonton? ML: It was unfortunate that my time was cut short and my last season with the club didn’t go the way anyone really wanted it to. However, to be honest, it led me to a really great opportunity over here in Hong Kong and kind of gave me the push to make the move so I try to focus on that side of it. I would prefer to not go into too much detail about what happened between me and the club. What I can say is that I have been in touch with one of the coaches who reconciled with me and I am grateful for that. I don’t hold anything against anyone at the club at all – It’s my hometown and nobody wants to see FC Edmonton succeed more than the hometown players. SSPC: What do you think could be done to improve the development system in Canada? ML: In my opinion the development system in Canada has a very long way to go if we want to achieve sustained success at the highest level. I think where we need to start is developing quality coaches at the grassroots level, where the focus is on technique and allowing kids to be creative. There is too much focus on winning and losing and at the early stages none of that should matter. What’s important is giving kids the tools to build off of and become their own creative players and developing an understanding about the game. There is such a focus on winning and losing which has led to years of Canada developing big, strong and fast players for immediate success at the youth levels, but as we can see when you get to the highest level you can no longer depend on size and speed to win games. I am very lucky to have a dad that was always putting the focus on skill and technique and no doubt is the reason I am where I am today.